“It’s time for you to look inward, and begin asking yourself the big questions: who are you, and what do you want?” It’s not exactly the stuff of your average American cartoon program, but this quote captures the essence of Avatar: The Last Airbender, an animated TV series aimed at 6-to-11 year olds that aired on Nickelodeon from 2005 to 2008. The series wonderfully combines elements of Chinese martial arts such as kung fu and tai chi, which provide the action and excitement, with Tibetan Buddhist philosophy. More surprisingly, it presents the audience with an unexpected level of character development, revealing a psychoanalytic process of unconscious conflict, repetition, and emotional resolution through relationship. In the series, the primary lessons in psychoanalysis reside in the relationship between the antagonist, the young and impetuous Prince Zuko, and his uncle, the staid but clever Uncle Iroh. As the viewers come to know Prince Zuko, they learn about the internal, unconscious conflicts that bedevil him. They watch him fight the same inner battles over and over in a colossal repetition compulsion. Zuko’s Uncle Iroh demonstrates a psychoanalytic posture with Zuko, refraining from passing judgment while Zuko rejects his uncle’s guidance and projects his conflicts onto Uncle Iroh. Through the relationship between nephew and uncle, Prince Zuko gradually comes to internalize his uncle’s guidance and face his inner demons, demonstrating an analytic process of transference, resistance, and working through his conflicts. We first learn about Prince Zuko as he is hunting down the protagonist of the story, Aang. Aang is a twelve-year old boy who has been deemed the “Avatar,” and is hence the namesake of the series, Avatar: The Last Airbender. The Avatar is like the Dalai Lama, a continuously reincarnated person who is meant to bring peace to the four nations of the world (the Air Nomads, the Water Tribe, the Earth Kingdom, and the Fire Nation). The Avatar is meant to accomplish this by becoming a martial arts prodigy, mastering the “bending” of all four elements: air, water, earth, and fire. As Wikipedia explains, “Each nation has a distinct society, wherein [some] people known as ‘benders’ have the ability to manipulate and control the element of their nation using the physical motions of martial arts” (https://en.wikipedia.org/wiki/Avatar:_The_Last_Airbender, accessed on March 30, 2016). So, an air-bender controls the flow of air as a martial art form, a water-bender controls the flow of water as a martial art form, and so on. Aang was born an air-bender, while Prince Zuko was born a fire-bender. At the beginning of the series, Prince Zuko is pursuing Avatar Aang on behalf of Prince Zuko’s father, the Fire Lord, who is the vicious ruler of the Fire Nation and a formidable fire-bender. The Fire Lord has waged war, even genocide, on the other three nations. Knowing very well that the Avatar will seek to defeat him, the Fire Lord wants nothing more than to capture Avatar Aang. Prince Zuko is therefore hunting Avatar Aang in order to bring him back to the Fire Lord. His mission, however, is not simply that of a son helping his father. In fact, his father has banished him from the Fire Nation, after Zuko spoke out of turn in a war strategy meeting. When a high-ranking officer suggested a plan to sacrifice some Fire Nation soldiers to gain an advantage in the war, Prince Zuko, who was fourteen at the time, vocally challenged the morality of the strategy. His father punished him by brutally burning and scarring him in a duel, and banished him for his weakness and lack of respect. Now sixteen years old, Prince Zuko has spent the last two years on an angry quest to capture Avatar Aang in order to save face with his father and regain his honor. He is accompanied on his quest by the Fire Lord’s brother, Uncle Iroh. At the beginning of his journey, Prince Zuko demonstrates one of the most basic principles of psychoanalysis: unconscious conflict. The idea here is simply that, like the rest of us, Zuko consciously wants one thing (to capture the Avatar for his father), but he has other, less conscious motives that conflict with his conscious desire. These unconscious wishes sneak out in devious ways. Consciously, Zuko believes he should behave like his father, espouse his father’s values, and identify with his unbridled aggression, in order to win his father’s admiration. Less consciously, though, he does not share those values. He questions his father’s supremacy, and, to a certain extent, he hopes to be a better person. Psychoanalysts emphasize how people repeat their unconscious conflicts over and over until the conflict is resolved, and Prince Zuko is no exception. His conflict reveals itself through a repetitive, unsuccessful compulsion to capture Avatar Aang. Although his father and his grandfather before him have attempted to capture the Avatar and failed (so the project is an inevitable setup for failure), Prince Zuko is determined to capture Aang and thereby regain his honor. His quest, like any repetition compulsion, feels involuntary, as though he has no control over his behavior. As he insists to his Uncle Iroh, “I have no choice, Uncle.” (S1E8) And, as is also the nature of the repetition compulsion, Zuko’s efforts constantly arouse the original feelings inherent in the conflict. At the end of Season One, Prince Zuko finally captures Avatar Aang but is stymied by the weather, and can’t transport him: “I finally have you, but I can’t get you home because of this blizzard. There’s always something.” (S1E20) He perpetually feels inadequate, powerless, and frustrated by his failure to achieve his mission, as he always felt with his father. While repeating his feelings of defectiveness, Zuko also plays out his ambivalence about his father by getting in the way of his stated goals. When his rival successfully captures Aang, Prince Zuko, dressed as the “Blue Spirit,” tries to steal Aang away, so his rival will not have the glory. Aang and Zuko end up cooperating to escape together, rescuing each other in successive turns. They end up together in a swamp, where ultimately, bared of his “Blue Spirit” mask and exhausted, Zuko lets Aang go. Zuko’s father will not yet have his prize. (S1E13) Such is the character of the repetition compulsion: it provides the same conscious feelings over and over again, while yet revealing the unconscious side of the conflict. Zuko’s trusted companion, Uncle Iroh, stays with Zuko through recurrent disappointments, and Iroh comes to recognize another element of the repetition compulsion. When explaining Zuko’s self-centered behavior to his crew (who are put in harm’s way by the compulsive search), Iroh notes, “The important thing is, the Avatar gives Zuko hope.” (S1E12) Indeed, every replication of the conflicted situation provides another opportunity to work it through. As mentioned, Prince Zuko is accompanied on his travels by his Uncle Iroh, who is the Fire Lord’s older brother and himself a former Fire Nation general in the war. In addition to training Prince Zuko in fire-bending, Uncle Iroh serves as Zuko’s analyst in many respects. The role of the psychoanalyst is to reserve judgment on his “patient,” adopt a stance of analytic neutrality, and seek to understand. The analyst discourages rash behavior, asking the patient to reflect before taking action and talk through the impulses behind behaviors. By adopting an open and accepting posture, the analyst conveys that all feelings are acceptable and can learn to be tolerated and understood in order to make constructive decisions. Like the analyst, Uncle Iroh accepts Prince Zuko for who he is. He stays with Zuko through repeated trials, and (unlike Zuko himself) he sees all sides of Zuko’s personality (including his failings, but also his hope and his honor). Perhaps most importantly, Iroh downplays the importance of capturing the Avatar, without diminishing his support of Zuko. While travelling alongside him, he encourages Zuko to eat, to drink tea, to take safety in a storm, and to rest: “A man needs his rest.” (S1E20) He acknowledges Zuko as a man, while he models the value of pausing and reflecting before jumping into compulsive action. Uncle Iroh also serves as a great model for tolerating feelings without allowing them to run your life. Like Zuko, Iroh has been disgraced, through the loss of his throne, and has suffered an immense tragedy, through the loss of a terrible battle in which his only son was killed. Unlike Zuko, though, Iroh is not drawn by his grief and suffering to repeat his feelings of shame or guilt. As a way of sublimating his pain, he connects with a cross-national group of peace-seeking individuals through a secret society, the Order of the White Lotus. He weeps at the memory of his son, and dreams about him, but he learns from life’s mistakes, makes sound choices, and finds joy in running his own teashop. Uncle Iroh is able to feel the full range of emotions without being tortured by them, and to make constructive decisions in his life. Transference is the word used to describe the way a person feels about other people (most especially his or her analyst), which reflects the way they felt about themselves and the important people in their lives during their childhood. (Freud originally used the word to describe patients “transferring” their feelings for their caretakers onto him.) By paying attention to transference, the analyst can understand their patient’s unconscious conflicts and early emotional states and figure out when and how to intervene. The trick for the analyst is not to react unwittingly to transference. This requires tolerating “countertransference” – that is, the feelings that the transference arouses in the analyst. Uncle Iroh is a master at managing Prince Zuko’s transference and Iroh’s own countertransference. This helps him ultimately build a constructive and influential relationship with Prince Zuko. At the beginning of their relationship, Zuko is totally demeaning of Iroh, who is, after all, his uncle and the rightful heir to the Fire Nation throne. Zuko bosses Iroh around: “Show me the next set.” “Take this to my quarters.” (S1E1) He denigrates him: “You’re out of your mind, Uncle.” “I don’t need your help keeping order on my ship.” (S1E12) Zuko treats Iroh as his father would treat Zuko, or as Zuko feels he should himself be treated – as a useless peon. Analysts refer to this as narcissistic transference – that is, Zuko treats Iroh as Zuko feels about himself. Very gradually, Zuko begins to develop a different relationship with his uncle, establishing a level of trust. After leaving Iroh for a personal quest filled with memories and a renewed sense of identity, Zuko returns to him, commenting, “I’ve realized lately that being on your own isn’t always the best path.” (S2E12) Zuko starts to fluctuate between relating to his uncle as a real person and treating him no longer as an extension of himself, but as an extension of his (terrible) father. At the beginning of Season Two, Zuko’s sister, a carbon copy of their father, convinces Zuko that their father wants to welcome him home. Zuko is so happy: “He cares about me!” Iroh, realistically suspicious, responds, “I care about you!” Zuko regresses: “You don’t know how my father feels about me – you don’t know anything!” Iroh calmly explains, “I only meant that in our family, things are not always as they seem.” Zuko fires back, “I think you are exactly what you seem: a lazy, mistrustful, shallow old man who’s always been jealous of his brother.” (S2E1) At this point, Zuko is confusing Iroh with his own father, who is indeed a mistrustful, shallow man who’s always been jealous of his brother. Prince Zuko is now fully in the throes of the “object transference,” in which he transfers the feelings about an early object (his father) onto the analyst (Uncle Iroh). Iroh, though, has been a true father to Zuko, and continues to take care of him. Iroh helps Zuko escape from his conniving sister, who becomes their common enemy. When Zuko’s sister later attacks Uncle Iroh, severely injuring him, Zuko begins to take care of Iroh, with a deeper level of appreciation. He makes him tea and tends to his burns. He genuinely asks Iroh for help for the first time, requesting training to learn to defeat his sister. “I know what you’re going to say: She’s my sister and I should try to get along with her,” says Zuko. Iroh, perfecting his joining technique, responds, “No, she’s crazy and she needs to go down. It’s time to resume your training.” (S2E8) They are now a team. In analytic terms, this means that the transference is beginning to dissolve, which paves the way for Zuko to resolve his resistances to fully knowing himself and his true destiny. Resistance is the term that analysts use to describe the forces that get in the way of the patient’s progress. Most often, resistance takes the form of a person’s unconscious interference with his or her own self-understanding. Transference is, in fact, a resistance, because for as long as the patient sees the analyst through self-tinted lenses, she does not recognize her true self. Back at home in the Fire Nation, Zuko revels in glory, for his father believes he slayed the Avatar. Iroh, however, is imprisoned as a traitor. When Zuko visits him, Iroh silently turns his back, forcing Zuko to work out his own conflicts. Zuko’s emotional progress has not all been wasted, and he confesses, “I have everything I ever wanted. But it’s not at all how I thought it would be…. Please, Uncle, I’m so confused, I need your help!” (S3E2) In a later episode, he reflects on his recent days with his father. “I was the perfect prince, the son my father wanted, but I wasn’t me.” (S3E9) To some extent, Zuko has internalized Uncle Iroh’s teachings. He finally begins to recognize that he is his own person, and he begins to work on his own resistance to understanding and knowing himself. Over time, Prince Zuko comes to recognize and accept many different parts of himself. The long process of having these recognitions sink in, reconcile, and resonate with oneself is known as working through. At one point, Uncle Iroh advises Zuko, “Evil and good are always at war inside you, Zuko…. But, there is a bright side…. Born in you, along with all the strife, is the power to restore balance to the world.” (S3E6) As Prince Zuko gradually comes to understand himself, he works through his internal conflicts, a process that helps him create his own destiny. Having come to understand the many parts of himself, to identify more with his mother’s benevolent nature, and to internalize Uncle Iroh as loving protector and balanced sage, Zuko is finally free to pursue his own destiny, to teach Aang fire-bending. He encounters a serious problem, though. No longer sourced with rage, his fire-bending is weak. Where once there were explosions, there are now little poofs ending in wisps of smoke. (S3E13) This scenario represents a further, less fraught development in the phase of “Out with the old and in with the what?” Having finally discarded his repetition, symbolized by his throwing away the “Blue Spirit” mask (S2E17), Zuko needs to build himself anew. He will do it by developing symbolic understanding. Symbolism is a key feature of psychoanalysis, because when people can’t communicate their unconscious using language, they communicate it through other forms of symbolism. Dreams, fantasies, play, and other communications can suggest to the analyst, through symbolism, hidden aspects of the patient’s psyche. When a person develops a greater capacity to put all parts of themselves into words, they also develop a greater ability to use symbolism to make meaning, as with language, poetry, or insight. 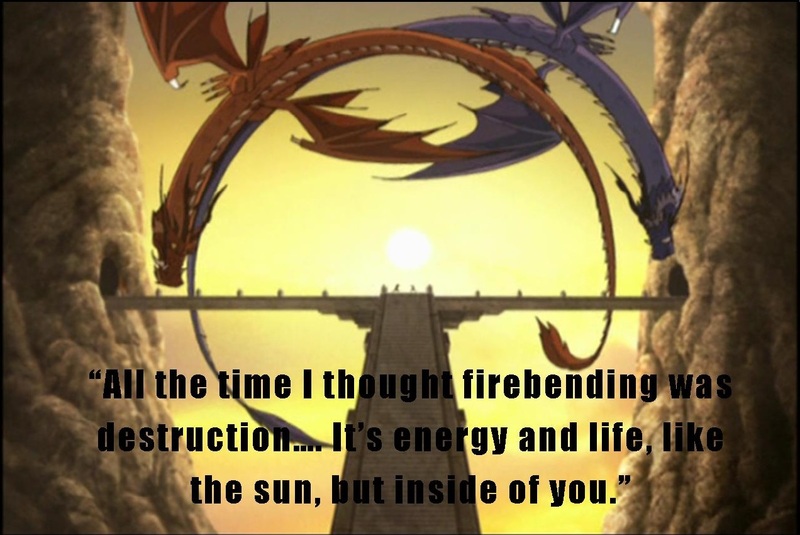 In Zuko’s case, he uses dragons to develop a symbolic understanding of aggressive, destructive, and constructive forces. The Sun Warriors give Aang and Zuko a test: to each carry a flame up a high, steep set of stairs to present to the dragons. The chief warrior advises, “You must maintain a constant heat. The flame will go out if you make it too small. Make it too big, and you might lose control.” When Aang receives his flame, he exclaims, “It’s like a little heartbeat.” The chief agrees, noting that “Fire is life, not just destruction.” (S3E13). Through his personal struggle, Prince Zuko offers a rich and accessible lesson on the elements of psychoanalytic transformation. Faced with tumultuous inner conflicts, he initially plays them out through repetitive and ineffective actions. With the help of Uncle Iroh, his non-judgmental role model onto whom he projects his feelings about himself and his father, Zuko gradually learns to tolerate and assimilate the most painful parts of himself. 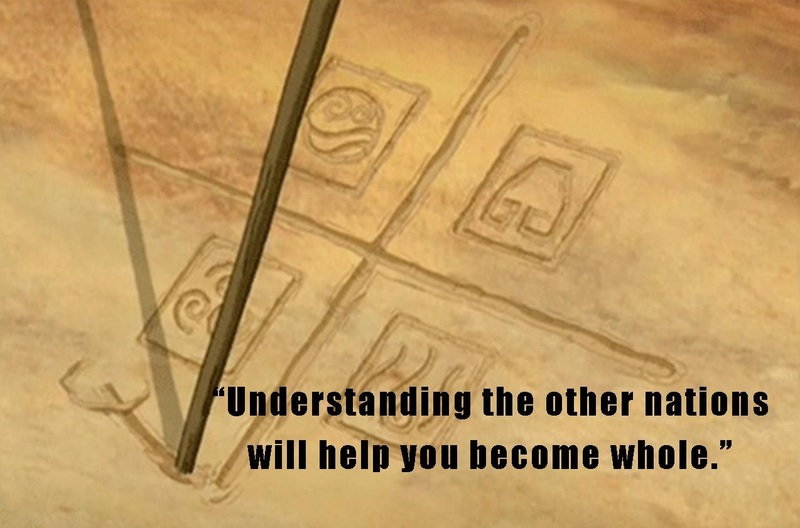 By integrating his aggression with his life-promoting drive (symbolized by his well-controlled fire-bending) he develops new, constructive relationships with himself and others and frees himself to choose a new destiny. He has my vote as Best Cartoon Character Ever (with Uncle Iroh not far behind).